The legend of Elisha Scott will live forever in Liverpool folklore. Arguably the greatest goalkeeper to keep goal for the Reds, Scott remains one of the most famous figures to have represented the club, despite playing his last game way back in 1934. Born in Belfast, he followed in the footsteps of his elder brother Billy, who was a goalkeeper with Everton and Ireland. Scott junior signed for Linfield at just 14 years of age but was soon moved on to junior club Broadway United where he learnt his trade before Billy recommended him to his peers at Goodison. Fortunately for Liverpool, Everton deemed him to be too young and when Billy then mentioned Elisha to Anfield chairman John McKenna, the Reds did not hesitate in swooping to sign the rookie 17-year old. With the experienced Kenny Campbell still keeping goal for Liverpool, young Scott was considered one for the future. But it was not long before he made an impression. Making his first team debut against Newcastle United on New Years Day 1913, he kept a clean sheet in a goalless draw and, so accomplished was his performance at St James Park that afternoon, opponents Newcastle offered J1,000 for his signature immediately afterwards. Scott was only informed of the bid on the way back to Liverpool and believing that Campbell would be difficult to dislodge, he thought it might have been in his best interests if he was allowed to go. Liverpool's secretary/manager Tom Watson, though, wisely refused and reassured Scott that his future lay at Anfield. He was right. 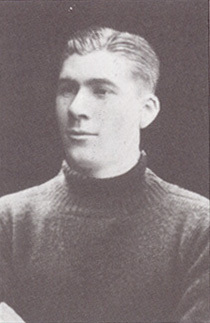 Towards the end of the 1914/15 season Scott enjoyed an extended run as Liverpool's first choice keeper and, although the advent of World War One interrupted his progress, as the 1920's dawned he quickly earned a reputation as one of the finest custodians around. In 1920 he won the first of his 27 international caps and in 1921/22 missed just three games as the Reds won their first league title for 16 years. The following season he was an ever-present between the sticks as the championship was retained. Scott was by now a firm favourite of the Anfield crowd and the adulation he received was unprecedented. In 1924, after pulling off a stunning save at home to Blackburn Rovers, one fan ran onto the pitch and kissed him! The years that followed the back-to-back title triumphs may have been barren in terms of honours won but Scott's popularity never once waned. In 1934 the unthinkable almost occurred when Everton offered J250 for his services. He was coming to end of his career and Liverpool were ready to accept the offer until supporters flooded the local newspaper with letters of protest. On February 21, 1934 Scott played his 467th and final game for Liverpool - it was a record that stood until Billy Liddell surpassed it in 1957. Anfield's favourite son requested a move back to Ireland to take up the post of player/manager at Belfast Celtic and on the occasion of Liverpool's final home game of that season hardened Kopites were rumoured to have shed tears when their hero made an emotional farewell speech from the directors' box. He finally retired from the game in at the age of 42 in 1936 and continued to manage the Belfast club until it folded in 1949. Ten years later the legendary Elisha Scott died. Gone, but never forgotten. 1920 v Scotland, England; 1921 v Scotland, Wales, England; 1925 v Wales, England; 1926 v Wales, Scotland, England; 1927 v Scotland, Wales, England; 1928 v Wales, Scotland, England; 1929 v Wales, Scotland, England; 1930 v England; 1931 v Wales; 1932 v Scotland, England, Wales; 1933 v Scotland, England, Wales (27).